Nowadays Dracula and his kind, the Vampires have become part of all kinds of entertainment. It’s only natural that videogames would include these characters. There’s a whole series of games based on the Dark Lord’s Legend, where there is at least one vampire or a creature with vampiric powers e.g. the Vampiric Lion in every RPG –Role Playing Game- edition. A legend among these games is Vampire-the Masquerade. Though I have never actually played it, I’ve read the best comments about it in books and magazines about games and also vampires. The series that rotates round the legend of Count Dracula is Castlevania. In this game there are enough similarities and differences to write a small book. Yet, I’ll try to be as curt as I can. Dracula is the fiend that will have abducted or killed a young woman. He transforms only in the ultimate battle. 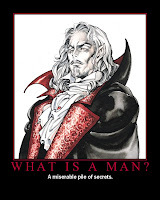 His reformed son, Alucard, who is with the “good guys’ can turn into a wolf, a bat or mist.The areas in the games, such as Subterranean Hell, the Demon Guest House, the Gypsy Village outside the Castle, the Mine of Judgement, the Abyss –the entrance to Hell- are all of close reference to the book. We can easily recognise Dracula’s wherabouts and Johnathan Harker’s dwellings in Transylvania. Dracula can be battled by swords, spears, axes, the holy water and the crusifix. However, he can only be slain by the Vampire Whip. That is why he reappears every hundred years.Technically, the H/P button (Heath/Hit Button) makes it difficult to aim exactly at the opponents neck. So, beheading the fiend is out of the question. A major difference is the presence of Death, who converses and battles the main hero in every title. Also, areas such as the Garden of Madness, with the carnivorous plants, the Wizard Lab, where mutated creatures are made and a Time-travelling character, bare the influence of our times on the game. Finally, Dracula’s undeathness, necromancy and above all, untangible mystery has passed on from Stoker’s book to the electronic era. Διαβάστε το κείμενο του Κώστα στα ελληνικά πατώντας τον τίτλο.